New York (NRF15 Booth #1121)--Jan. 12, 2015--Springboard Retail, a cloud POS and retail management platform to help retailers sell more, and sell smarter, and NuORDER, a B2B E-commerce platform, have announced their partnership, allowing fashion brands and retailers to improve their buying and order management processes — saving time, buying smarter, and supporting higher sell throughs at better margins. NuORDER, designed to facilitate the interactions of brands and retailers specifically in the apparel industry, allows retail buyers to place orders quickly and accurately online, and spend more time communicating and building relationships with customers. With the Springboard Retail partnership, when a Springboard customer places an order in NuORDER, it is immediately visible in Springboard’s inventory management platform, making data instantly reportable and orders instantly available for receiving. Through this partnership, the entire buying and reordering process is faster and smarter. Springboard Retail is a cloud POS and retail management platform designed for retailers, by retailers. It’s built for multi-store, multi-channel retailers who need to service every customer the same way, no matter how or where they shop. Using Springboard’s Mobile POS to reclaim valuable square footage and influence buying behavior at the point of decision, Springboard customers process $200 million annually across the United States. 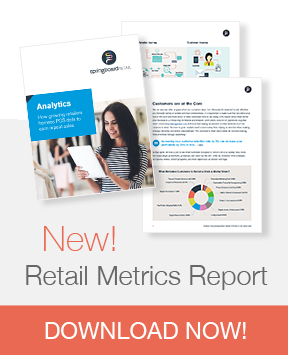 Springboard Retail gives retailers better control over sales and profitability by placing actionable real-time data in the hands of every person who needs it, from the C-suite to the store floor. With inventory management, unparalleled custom reporting, open APIs, and portability across platforms and devices, Springboard Retail is easy-to-use, quick-to-start and revered by its users for making their jobs easier. Springboard Retail is based in Boston, Massachusetts. Follow us on Twitter @SpringboardUp. NuORDER powers B2B E-Commerce for over 500 vendors & 100,000 buyers. NuORDER’s mission is to eliminate pen and paper while driving sales for brands and empowering retailers to buy more effectively. NuORDER’s two-way sales and buying platform provides a feature-rich, enterprise class solution wrapped in a beautiful interface. The software utilizes cloud-based architecture and a native iPad app, which allows users to conduct business anytime, anywhere. Dedicated to helping businesses increase their B2B sales since 2011. Visit www.nuorder.com for more information.